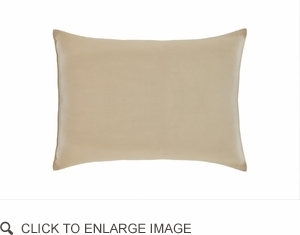 • This organic merino wool pillow gloriously eliminates the “wet-and-soggy-pillow-while-I-sleep” experience. Less time is spent tossing and turning. • Dust mites cannot survive in wool because wool allows evaporation of the moisture it has wicked away from the body. • As with all the beneficial wool bedding products by Sleep & Beyond, myMerino Pillow successfully provides year-round comfort as it helps maintain the body’s temperature. • myMerino Pillow is successful providing the most valued benefits of a pillow: comfort, support and health. • Provides relief from MCS (multiple chemical sensitivities) as they are free of carcinogenic chemicals. • Lasts for many years with proper care. Wool out-performs other fibers used for bedding. • Quickly wicks away moisture without making you feel cold or clammy. • Encased in certified organic cotton. • Filled with fine certified organic merino wool. • Perfect for year -ound comfort. • Comes in eco-friendly and reusable cotton packaging. • 3rd party certified to industry’s leading organic certifications. • Spot clean only. Removable, washable protective cover recommended.